OK, not everyone in a life jacket survives. Roughly only 15 out of 16… Conversely, if you go in the water without a life jacket, only one guy comes out. The other 15 died. Life jackets save lives. This column is about that. Boaters end up in the water for a variety of reasons but the two largest – capsizes and falls overboard – comprise nearly 60% of all fatalities. Let me rephrase that. A fatality is a death – let’s not mince words like “PFDs.” Remember, for every 16 boaters that go into the water without a life jacket, only one comes out. The other 15 died. And, if you have been smart enough to take a boating safety class, remember this. You’re not alone out there. You’re not getting it on. Unless you try this idea, which I thank friend and colleague CAPT John Konrad for detailing. Learn this 30-Second Lifesaving Skill! 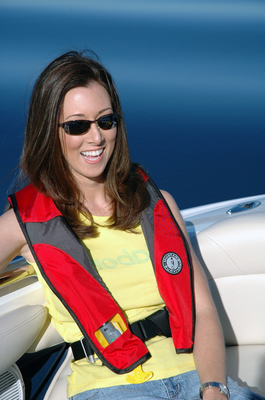 It’s easy to don (put on) a life jacket or inflatable vest in the cabin or cockpit. Just like a coat, you stick one arm through a hole; swing the jacket around your back; then stick your other arm through the other hole. However, this sequence of actions will be impossible to duplicate in the water. Most of your body will be submerged with just your head and shoulders exposed above the sea surface. 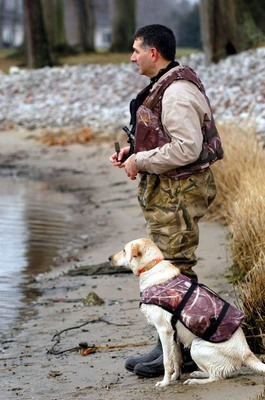 You must use a simple, little-known method to don any life jacket in the water. Practice this important skill in the comfort of your home. Train your crew. After two to three minutes of practice, most folks can do this in less than 30 seconds. Follow these five easy steps. Grab the collar of the life jacket. Pull the life jacket close to you. Turn the jacket so that it floats with the front pointed toward the sky. Unclip all snaps and straps. Open the life jacket all the way so that it lies almost flat on the water surface. Keep the collar close to you (illustration 2). Thrust each arm as far as possible through each arm hole (illustration 3). Raise both arms in a smooth, fast motion above your head and slightly back (illustration 3). Fasten all snaps and straps. ✔ Kneel down next to a table about chin height. ✔ Place the life jacket on top of the table. ✔ Follow steps 1 – 5 above. ✔ Practice until you can complete all steps within 30 seconds. ✔ Train your sailing crew. What to Wear by Whom? 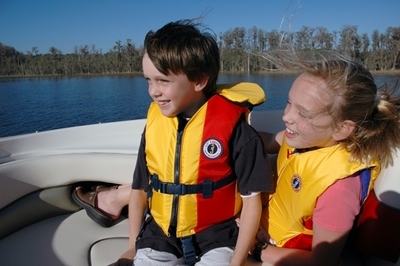 USCG regulations require a life jacket aboard for very boater aboard unless they are under 13 years old. Then they have to be on. But didn’t we make the point above that if you do fall overboard and you don’t have one on, it is pretty unlikely you’ll be able to get into one? Isn’t it too late then? Yes, yes, and yes. So why only have the kids wear it? And all those kids, seeing dad not wearing one, are saying to themselves, “I can’t wait until I’m old enough not to wear one…” What a lesson you’re teaching, skipper. Oh They Are So Bulky! You can even get children’s style that have a loop at the collar so you can scoop them up, one-two-three, if the tyke falls in! And don’t forget one for the old sea dog – and his pet.